Which Ad Sizes Work Best On Mobile? You’re finally convinced about the benefits of launching your bank’s first mobile marketing campaign. You know how to get started, you have your data lists and your target locations ready, and you know exactly what you want your creative to look like. But, where should you place these ads and what are the optimal sizes? Let’s first discuss placement. Up until 2017, Google had some strict regulations regarding ad placement on mobile devices. With the exception of 320×50 banners, mobile ads were not permitted to be placed above “the fold” of the page. You might be wondering what is “the fold”. The fold is the area the user can see without having to scroll. Think of it as a newspaper. The part of the paper that gets the most attention is the top of the front page because that’s what the viewer can see even when the newspaper is folded. The same works for web pages and mobile apps. However, Google has lightened up on its placement restrictions and now permits larger ad sizes to be above the fold as they found that it does not disrupt the user’s experience. Google has found that the best placement for your ads should be when those are divided, presenting half of the creative above the fold, and the other half below. This method makes the user scroll down the page and, indirectly, look at your promotion or offer in full. Now that we know where to place the ad, the big question is which sizes perform better? Believe it or not, size does make a difference. It’s no surprise that the large ad sizes tend to produce better results than small banners. Google found that, on average, the ad size that reaches the highest CTR (click-through-rate) is 300×250. This size is a happy medium – it’s large enough to catch the interest of the audience and doesn’t cause many accidental clicks. Larger ad sizes, such as 320×480, can also perform well but have a higher rate of accidental clicks, leading to a negative user experience and a high bounce rate. 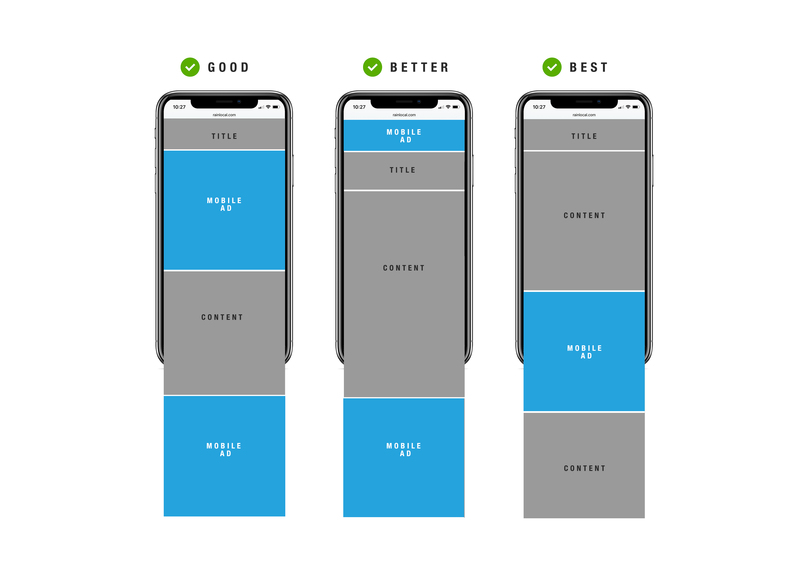 Smaller banner sizes, such as 320×50, have the lowest performance rate, which makes sense considering that the smaller the size is the harder it is to attract user’s attention. Ads become less readable and the images are not big enough to create a visual impact. The bottom line here is that larger ad sizes perform the best, but can have consequences. At the end of the day, each creative set can impact your audience differently depending on the images used, and the amount of characters used as copy. That is why it’s good practice to resize your creative assets to as many different sizes as possible. Launch them all, and see which ones perform best on each of your campaigns. The best part about working with companies like RAIN is that you have access to real-time results, and a team behind you who will optimize your campaign on a daily basis, making your campaign as successful as possible.